The full forwards are back. Mark LeCras recently kicked 12 against Essendon, Jumping Jack Riewoldt is kicking a bag most weeks, and Bustling Barry Hall is also in the mix. But will any of them get to the century? It's unlikely, but not out of the question. Lance Franklin was the last AFL player to kick a hundred goals in a season, in 2008. It was only the 57th time it had been achieved, in more than 100 years of the AFL/VFL, by only 28 footballers. It is always a major event, with a grand, eccentric tradition of fans flooding the oval after the hundredth goal. Of course this celebration of centenaries occurs not just in football. Centuries in cricket are met with great acclaim, and batsmen have to survive the nervous nineties to get there. 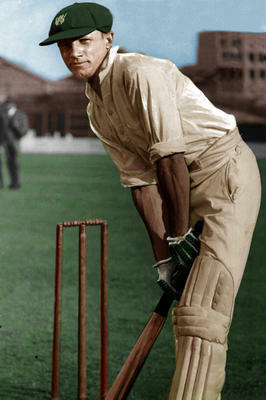 And, famously, Sir Donald Bradman fell just four runs short of averaging 100 runs over his test career. Beyond sport, we are forever celebrating centenaries and their multiples. There were huge celebrations last year for Charles Darwin's 200th birthday. This year is the 100th anniversary of the death of the writer Mark Twain, and it is also a milestone for mathematician Robert Recorde, who we recently had cause to mention: this year we celebrate Recorde's 500th birthday. In fact, you don't even have to be famous: make it to your 100th birthday and the Queen will send you a letter of congratulations. Everywhere, all the time, we're celebrating centenaries. But why, exactly? Sure, 100 is simple to write. But, it's only simply written because we are writing it in our base ten system. For example, if we were Simpsons characters, each with eight fingers, then we'd currently be honoring the 144th Anniversary of Mark Twain's death. On the flipside, yesterday we would have been celebrating Jack Riewoldt's and Barry Hall's 100th goal. 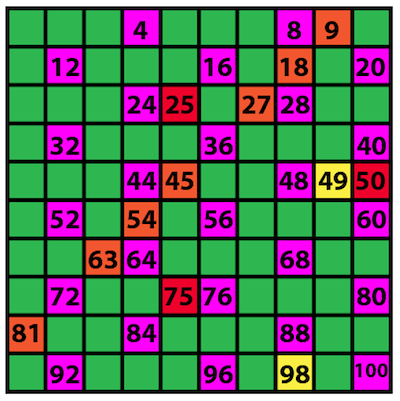 We wrote of all this recently, the importance of not confusing numbers with how we represent them. The question is, ignoring the symbols, is there anything particularly special about the number one hundred? But even while trying to remove our base ten blinkers, our vision is not so clear. After all, we have to write the numbers in the table somehow, and not surprisingly we have chosen base ten to do so. And, where did we choose to stop our table? Doh! So, this centenary stuff is intrinsically of very little mathematical meaning. It is culturally and anatomically arbitrary. And, it is really hard to escape. But why are we suddenly so focused upon belittling centenaries? Well, this happens to be our hundredth Maths Masters column. And how do we feel about that? We're chuffed! Puzzle to Ponder: Feel free to suggest solutions in the comments section. Please also email us if you wish to be added to our email list. St. Kilda will, of course, win this year's AFL Premiership. Our desire is to celebrate this great (and rare) event often, so we're willing to honor anniversaries calculated in any base. If we then celebrate every 10th year, in which years will we be celebrating? Burkard will give a talk entitled Rubik's Cube: Solved, once and for all! Melbourne Museum, 11:30-12:30. For more information, please visit the MAV website.